Lift and Accessibility Solutions is proud to offer the Bruno Residential Vertical Platform Lift to our clients. Bruno’s lifts are made in the USA and provide a cost effective access solutions to your home. Gain easier access to raised entries, decks, or different levels in your home. The ride is smooth, quiet and easy to operate with maintenance free reliability. Vertical platform lifts are also called porch lifts or wheelchair lifts can be installed indoors or outdoors and are code compliant.If stairs create a barrier to enjoying your home, a Bruno stairlift helps restore access, safety, and peace of mind. 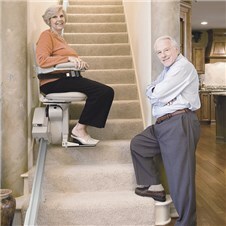 Family-owned, Bruno offers stair lift choices for every budget and space. 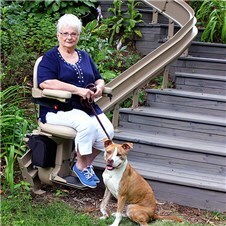 Lift & Accessibility Solutions is pleased to offer the wide range of stair lifts offered by Bruno. Elan Indoor Straight – is the affordable choice to help restore full access to your home. 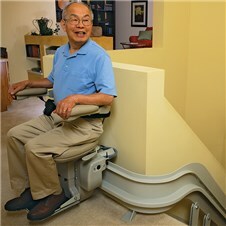 Elite Indoor Straight – upgraded straight stair lift with powered upholstery, power swivel seat and power footrest. Elite Outdoor Straight – features marine-grade fabric and a weather-resistant cover that travels with the chair to protect it from the elements. 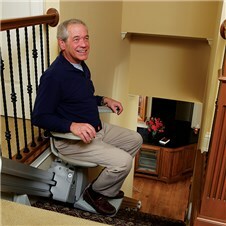 Elite Indoor Curved – built to the exact specifications of your staircase, the Elite stair lift melds into every curve. Elite Outdoor Curved – is custom-built to the exact angles of your stairs. 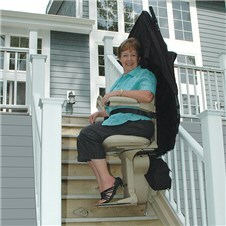 Bruno’s Elite Curved stairlift is performance tested to extreme temperatures and lifts up to 400 lbs.